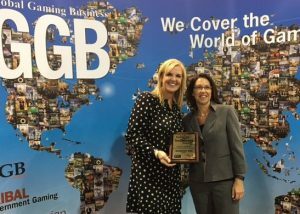 Alpharetta, Georgia – September 29, 2016 – The Rainmaker Group, the premier provider of revenue and profit optimization solutions to the gaming & hospitality and multifamily housing industries, today announces that it has been awarded the gold medal for Best Productivity – Enhancement Technology for its guestrev® (guestrev) platform in the 16th Annual GGB Gaming & Technology Awards. The competition, sponsored by Global Gaming Business Magazine, is the industry’s premier award program, recognizing top performing companies for showing excellence in innovation and practical application in all gaming disciplines. Rainmaker’s guestrev platform is the market-leading revenue management and profit optimization solution for forecasting and pricing hotel rooms. Backed by the best revenue management science in the industry, guestrev’s forecasting models pinpoint the specific factors that influence demand, so that revenue managers can understand this demand and optimize their pricing at separate customer segment levels. Currently managing over 150,000 rooms, guestrev goes to work for properties of all sizes, including traditional hotels, casino hotels, resort hotels and several of the world’s most recognizable hospitality brands. Rainmaker was founded in 1998 by entrepreneurs Bruce Barfield and Tammy Farley, who currently serve as CEO and president, respectively. Since its founding the company has continued to establish itself as the market leader in revenue management and profit optimization solutions for the hospitality & gaming and multifamily housing industries. The Rainmaker portfolio of solutions has expanded in order to continue providing top of the line service to its rapidly growing global clientele. GGB characterized this year’s winners as being at the cutting edge of technology, serving all facets of the gaming industry. A particular trend for this year’s awards saw a focus on technologies geared towards integrated resorts. Other award categories included Best Consumer-Service Technology, Best Slot Product and Best Table-Game Product or Innovation. For more information on guestrev and Rainmaker’s other revenue management solutions, please visit www.letitrain.com.